According to the American Red Cross, someone in the United States is in need of life-saving blood every two seconds. While medical advances have increased rapidly, there is still no substitute for the power source that runs through our veins. And although an estimated 38% of the U.S. population is eligible to donate blood, less than 10% actually does. January is an especially difficult time for people to donate blood because of challenging weather conditions, post-holiday buzz and winter illnesses. However, giving blood this time of the year is crucial, as the national blood supply often runs dangerously low. Since 1970, January has been recognized as National Blood Donor Month: a time to pay tribute to those who already donate, recognize the life-saving attributions of blood donations and encourage others to add save a life to their New Year’s Resolutions. If you’re still not sure if donating blood is the right decision for you, check out all the answers to your questions here, and help give life this January. Who do blood donations help? Blood donations help anyone who needs blood for any number of medical services. They help your friend, your family member and your neighbor down the street. In fact, one out of every seven people entering the hospital needs blood—and blood donations fill this need. According to the American Red Cross, during a regular blood donation process, the average donor will give about one whole pint of blood. This single donation has the potential of saving as many as three lives. There are four main transfusable products derived from this pint of blood: red cells, platelets, plasma and cryoprecipitate. In just one single day in the U.S., approximately 7,000 platelets, 10,000 units of plasma and 36,000 units of red blood cells are needed. Your single pint of blood goes towards meeting these needs. Many people can donate blood and don’t even know it. If you’re 17 or older, weigh at least 110 pounds and are in generally good health, you may be eligible to donate. While all blood types are wanted, there are some who are in greater demand. There are four main blood types: O, A, B and AB (positive and negative). The most requested blood type by hospitals is type O. Type O negative blood is the universal red blood cell donor, meaning it can be transfused to people of all blood types, especially in emergency situations and with newborns. And while only 7% of the U.S. population has O negative blood, only 3% has AB positive, which is the universal donor of plasma. 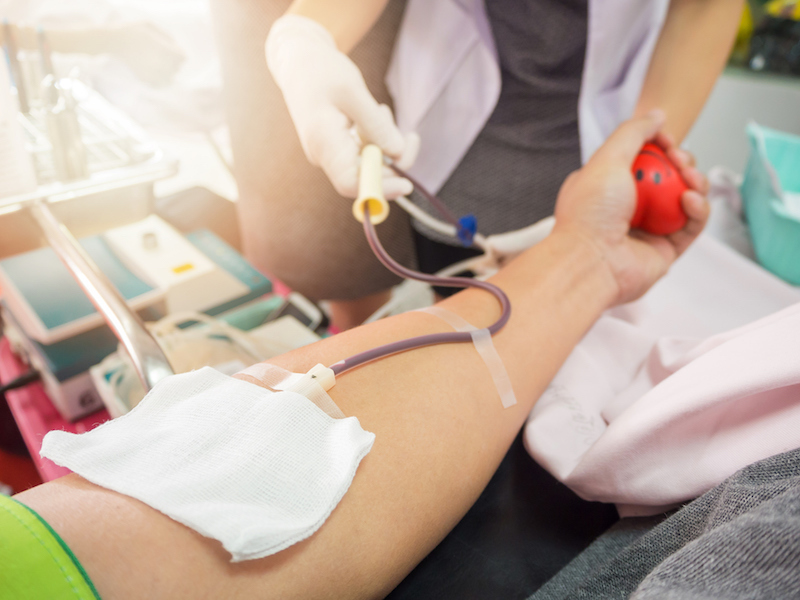 If you think you are eligible to donate blood, you can find your nearest blood donation center to learn your blood type and see the impact you can make. According to the Red Cross, the number one reason donors say they give blood is because they want to help others. The most common reasons people say they don’t give blood is because they never thought about it, or they don’t like needles. However, the donation process is simple and sanitary, with four main steps: registration, medical history and mini-physical, donation and then refreshments. The actual donation time lasts as little as 10-12 minutes, with the entire process typically being about an hour and 15 minutes. And while needles can be scary, the potential of saving lives is definitely something worthwhile. If you’re interested in donating blood this January, you can go online to find the closest blood drive location, either nationally or through your local blood bank. You can even skip the line by registering online and making an appointment. Donating blood can seem like an overwhelming process, but the difference it makes is life-saving. This year, make your New Year’s Resolutions altruistic by celebrating National Blood Donor Month in January, and for the rest of 2017.